Pascale Petit was spotted by French actress Françoise Lugagne, while she worked as a beautician. She notized the young girl's beauty on the spot - proposing to her, to come and try to get a part in her husband's (director of cinéma) film "Les sorcières de Salem" in 1956 - who was looking for a young girl. Pascale Petit was extremely popular in the late fifties and sixties and she was compared as the new Brigitte Bardot. She played in many movies the female leading role. She followed her second husband Giani Esposito to Italy, and gave birth to two children. She went also to Hollywood where she played for example beside Ray Danton and only returned to French cinema in 1971. Pascale Petit is the mother of Doushka Esposito, who is a very popular singer and Animator for French Television. 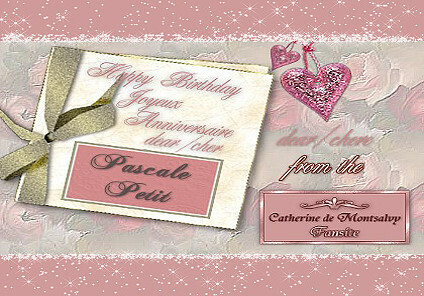 In our beloved series "Catherine, il suffit d'amour, Pascale Petit played "Catherine's" motherly friend, "Sara. We adored her in that most important role, what would our heroine done without her? A character, even Arnaud de Montsalvy, bowed his head!
. . . ✿•*¨`*•.¸(¯`v´¯)¸.•´*¨`*•✿ . . .
Pascale Petit during the shooting of Catherine, il suffit d'un amour in1986. One of the hundreds of souvenirs in Dame Marion Sarraut's, director of the the TV-Series Marianne, Catherine, The Lure of the Falcon and the Florentine. Thank you so much again dear Dame Marion for sharing this with me/us the Sarraut/Benzoni family.